Petit Design Co: Not so original! Apparently it made an impression since I didn't even remember having it in my favorites. Still it was fun to figure out the block for myself. I hope Amy doesn't mind that my subconscious really wants to be like her! There is no pattern for the way I made my block, I just made it up! 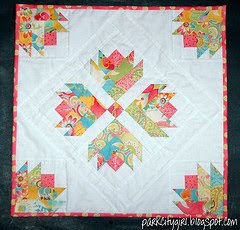 I think I will be writing a pattern for my quilt once it is finished though. So much for my originality! Then again, it's really hard to be completely original in quilting where creativity and inspiration is drawn from so many other blocks/quilts, it's hard to know who "did it" first. I love your Hunky Dory tulips! It will be a fabulous quilt! Our construction looks the same - my little flowers were 4.5" before sashing.